The latest effort to bring Bitcoin into the mainstream: brand a college bowl game. 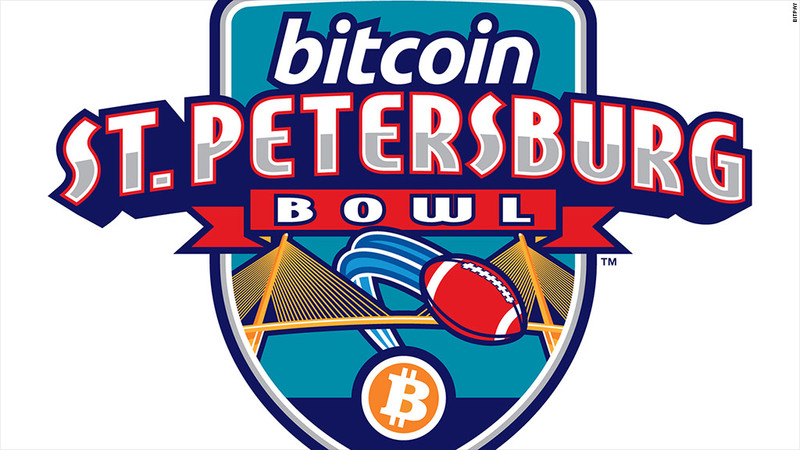 Say hello to the "Bitcoin St. Petersburg Bowl," the new name for an annual postseason football game on Florida's west coast. If it sounds a bit awkward, it is. The company that paid for the naming rights to the game through 2016 is BitPay, which processes Bitcoin payments for businesses. BitPay is hoping the game will pique interest in a currency that's gained popularity with merchants. Related story: What is Bitcoin? In the last few months, several companies have started accepting bitcoins, from a car dealer in California, to Expedia (EXPE), Dish Network (DISH) and Overstock.com (OSTK). And it's gaining attention as governments formally acknowledge it. BItPay's executive chairman, Tony Gallippi, said a Bitcoin Bowl is more about promoting the digital currency and less about his company. He hopes BitPay can just ride the wave as Bitcoin gets more popular. Gallippi declined to say how much his company paid for the sponsorship.